Wernerfield Architects designed this modern home for the site at 4639 South Lindhurst Avenue. In this Strait Lane area neighborhood, Braxton Werner and Paul Field were inspired by the original modernism and scale of the period homes in the neighborhood while advancing contemporary architectural design. Addressing the pond on the east of this one-acre site, Paul Field and Braxton Werner designed a C-shaped courtyard, allowing multiple views of the pool and garden created by landscape architect David Rolston. Currently, you can drive by and see this 4,600 square foot modern home come out of the ground. 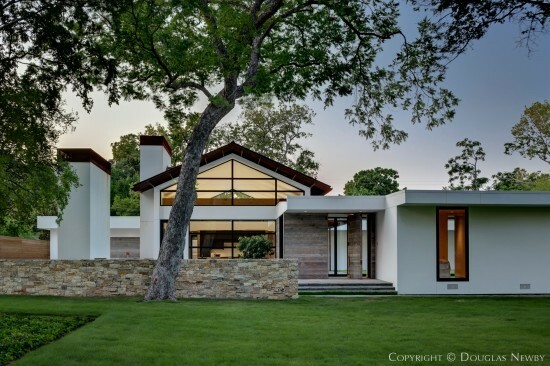 It is a great example of architecture that make a positive impact on a Preston Hollow neighborhood and Dallas.